Oh Pinterest, you amaze me! Even though I still never give you enough credit and pretend to despise you. I will say, I don’t understand why people pin outfits for seasons or outfits, it’s really odd to me. Anyways, back to the subject at hand — me trying to cook still. We didn’t have anything planned for dinner, so I went to Pinterest for some PINsipration for dinner. I looked through my Maybe I’ll Make it One Day board for some something and I came across something I’d pinned previously. The criteria for the recipe for dinner had to be minimal ingredients, something an 8 year old would eat, something a somewhat picky adult would eat, and something that didn’t take too long to make and/or prep. J and I have gotten pretty good at text conversing about dinner plans, now that we have L all the time. This was no different, I sent him the pin and he said he was down with Parmesan Chicken Roll Ups from Mitzi at Written Reality. J and L did the necessary shopping, while I worked out at Midtown — since I didn’t get up at 5AM that day 🙁 We had a few things and made a few minor adjustments to the recipe. When I got home, we switched, he went running and I made dinner! In as mall bowl, mix together the mayonnaise and 1/4 cup of Parmesan cheese. This will serve as a wonderful coating for the chicken to give it an extra kick of flavor. Unroll each triangle of crescent rolls and place one piece of chicken at the wide end of each one. Spread a good layer of mayonnaise mixture on top of each piece of chicken. Roll the crescent dough around each piece of chicken and place on prepared cookie sheet. Melt the renaming tablespoon of butter in the microwave and brush over the tops of each crescent roll. Then sprinkle each roll-up with the remaining grated Parmesan cheese. So I didn’t quite follow this to a T! I don’t do mayonnaise, even though we have it in the house now, it is for L and J if they want it on their sandwiches. I despise that stuff and am grossed out by looking at it :/ So instead, I improvised and melted some butter and mixed in the Parmesan cheese to coat the chicken. Since I didn’t let the chicken cool off, it made making the roll-ups really hard to do because the heat was making them really soft and sticky — which makes crescent rolls hard to shape. 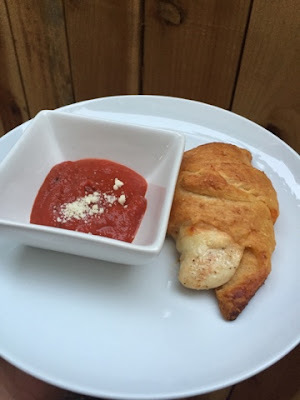 Also, I dusted each crescent roll with marinara before placing the chicken on it. Also, next time I won’t prep the rolls until the chicken is done AND cooled off. We used Swiss cheese, but they slices were too thin — next time I’ll use more cheese. I knew they weren’t going to look pretty, due to the difficulty of rolling them. Cooling off the chicken would have been a good thing for me to be patient about. Also, if I make these again, I’m thinking I’ll just buy large chicken breasts and cut them to the size I want them to be, not buy the chicken tenderloins as they were called. They were a little big compared to the roll. Also, I think it would be just as good with shredded chicken, maybe I’ll try that. I think these would be a great thing for me to bring to Girl’s Night too. I will definitely be making these again, for the house or for Girls Night, that is to be determined. They are tasty, because crescent rolls are amazing! They are quick and really easy to make, plus you can prep the chicken beforehand if you wanted to save some time. Throw it all together as the oven warms up and then you’re set! It was a great pin to discover and it’s been fun to try new recipes, even if they aren’t gourmet or intricate. I probably should have snapped a pic of how funky looking they turned out. I’m 2 for 2 in not making my food look good right now, that’s a pretty bad stat.